It’s a sad truth that modern manuals don’t encourage consumers to learn technical things about the stuff they buy. Back in the day if you bought a home computer it’d have a descirption of every connector, a copy of basic and a brief programming guide. Now you’re lucky if there’s room to describe the power switch after fifteen pages of epilepsy warnings and fancy icons telling you not to leave your expensive hardware outside in the snow. The good old days, then. When Nintendo released their Famicom Disk System they included with every unit two manuals: One with an adult-oriented description of the system, its functionality and so on. They also included a kid-friendly comic that detailed not only how the system should be used and the things you shouldn’t do, but also the inner workings of the device. Included were cutaway drawings, explanations of magnetic media, troubleshooting advice, flying space aliens with tails and the obligatory hot foreign woman to ensure the reader was paying attention. Naturally we couldn’t let a gem like this languish in Japanese. 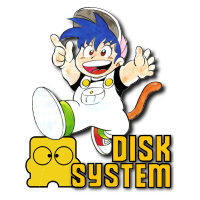 We’ve translated the book and created an English Famicom Disk System Guide. Please, enjoy.